We hold Cyberia in special regard. Not only does the work for the internet service provider rank quite high in our portfolio as an example of a successfully applied methodology that we truly believe in, but it’s also testimony to the importance of an agency-client dialogue. Simply put, without the collaborative spirit that exists between Cyberia and Mind the gap, the outcome of the work cannot attain the degree of radicalness it deserves: complete integration between “image” and “message” where the brand is notably strengthened by becoming the unique central driver. Positioning is key here, and the way Cyberia acquired a larger than life consumer-brand status is not by chance but, literally, by design. The work began with a rebranding exercise that enabled identity and communication, advertising and marketing, to emanate from and remain in service of a single core conceptual framework – one that is still going strong to this day. Cyberia’s mark can sit quietly in the corner as it can equally take center stage or even explode beyond its frame. 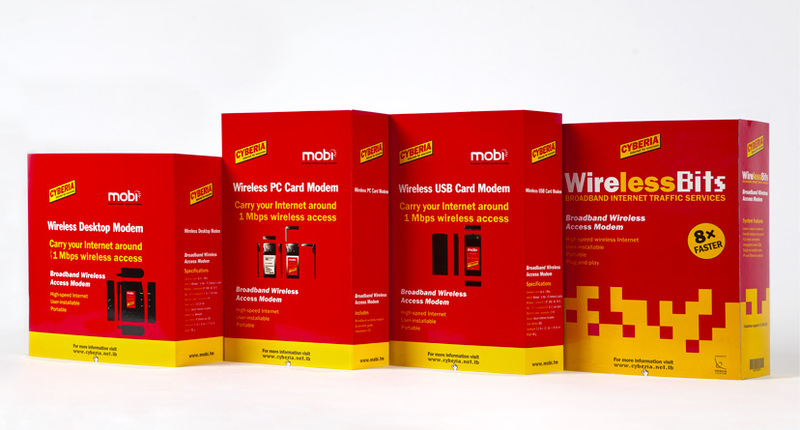 A range of printables, flyers, brochures, stickers and starter kits delivered messages and information to users throughout the years. Prepaid cards cover a range of internet consumption formulas. A sponsorship of a Lebanese rally competitor produced quite a few fun little nuggets. 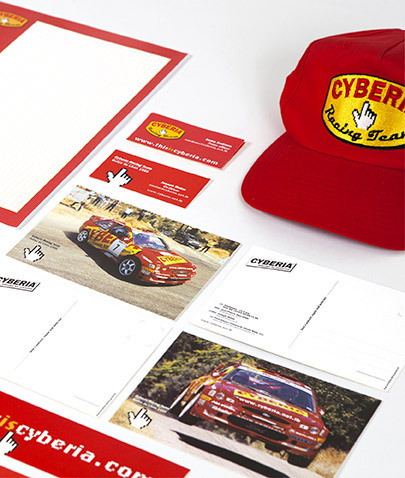 When we were approached by Cyberia in 1996, it was for the design of a one-off printable in sync with a pre-existing identity. But the conversation quickly turned to more fundamental matters. Our recommendation was to completely reposition and rebrand, based on an insight into the Lebanese market. At the time, internet service providers were still relatively new and the public perceived the online world as unfamiliar territory: technical, obscure, complicated. 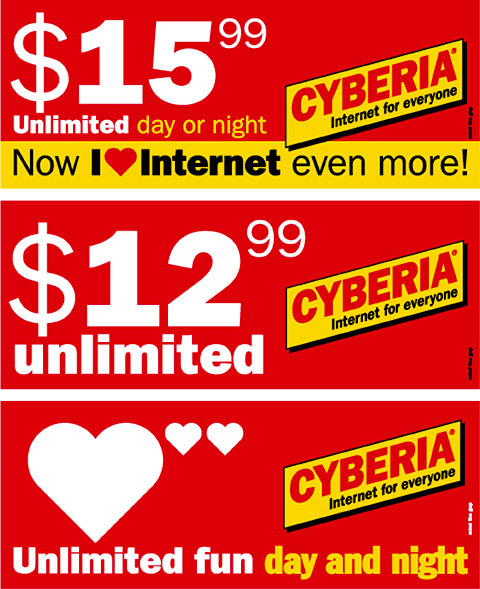 The idea was to transform the Cyberia brand into a household commodity: simple, reliable, affordable. Technology-driven visual codes were stripped away and a mass consumption aesthetic took over, one that in fact could belong to any other consumer product. In order to be effective, this strategy needed to go beyond the identity scheme and into an inventive sales operation supported by innovative methods, brand-focused communication, and an aggressive yet economical public presence. Internet became for everyone. The previous Cyberia logo, designed by Huda Smitshuijzen Abifares, was a well designed in-the-code mark that simply didn’t fit the new positioning. The occasional use of bitmap type and iconography connects the consumer brand to the digital world. 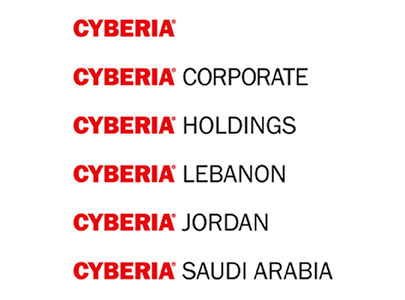 In Saudi Arabia and for a transitory period, a different name acquires the Cyberia look, counting on the image for linking the two country brands. For business to business operations, a corporate image is developed as the company goes regional. 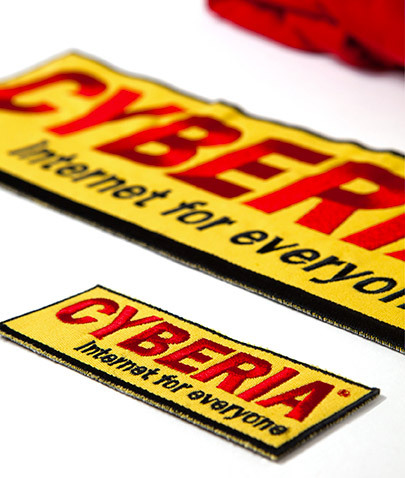 For product sub-brands, the Cyberia mark acts as a token endorsement. The product and corporate schemes are non-conflictingly differentiated. Over the years, Cyberia co-branded certain products, and created others like WirelessBits as its own sub-brands. 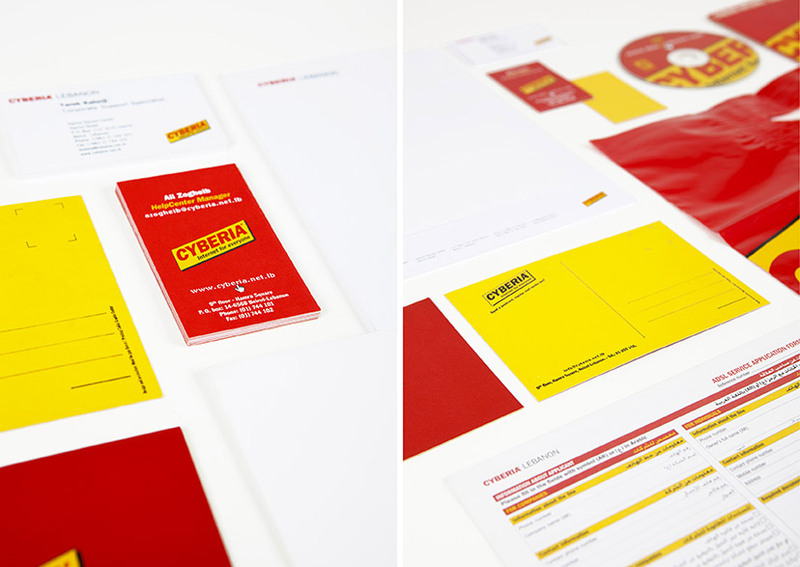 Many Cyberia products required the essential prepaid card. 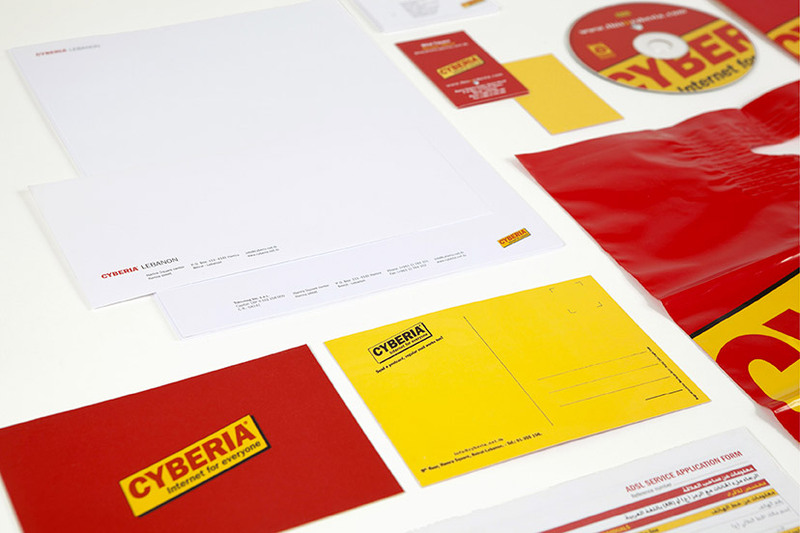 Following the consumer product repositioning and brand-centered communication methodology adopted for Cyberia, a number of sales and marketing tools were introduced to drive the brand home, so to speak. 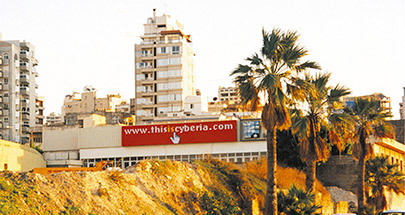 These include the CyberCredits system and the Cyberia Internet Starter Kit, facilitating recharge and installation respectively; country-wide neighborhood shops that functioned as branded re-seller outlets (with the internet re-seller lightbox not far behind as the subsequent model); the Cyberia fully-branded bus (a communication first in Lebanon) with CyberCredits purchasable on board; thematically fitting sponsorship activities; and selective cases of classic advertising. 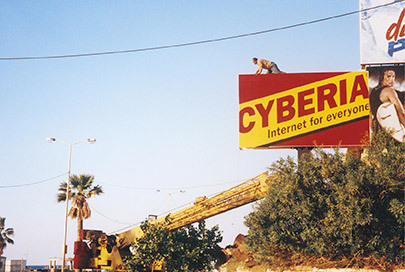 Cyberia quickly enjoyed an unmistakable level of brand awareness and was able to easily expand to new products such as pay-as-you-go internet, wireless internet and ADSL. Essentially, the strategy made it possible for a market late-comer to become the leading Lebanese internet provider in less than a year, a position still occupied today by this now household name. 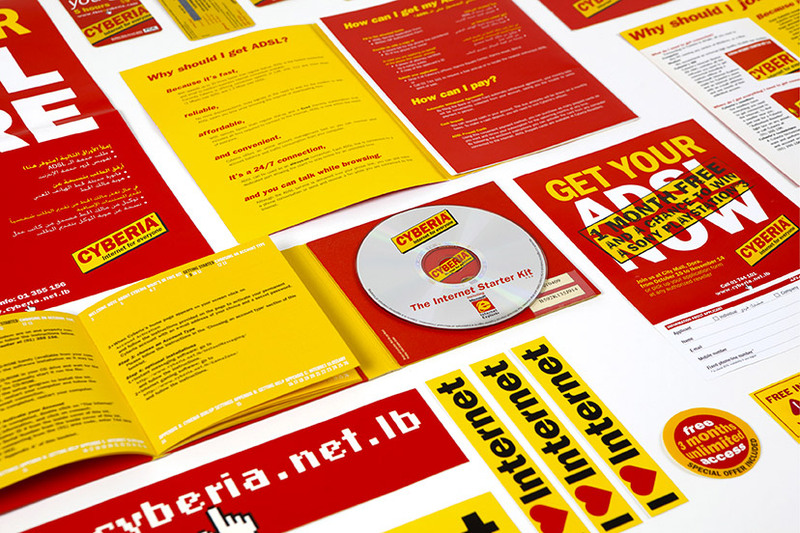 The Cyberia Starter Kits made it easy for consumers to feel on top of their game. The branding of re-seller outlets allowed for a long-term nationwide presence at a lower cost than a one-week TV commercial. 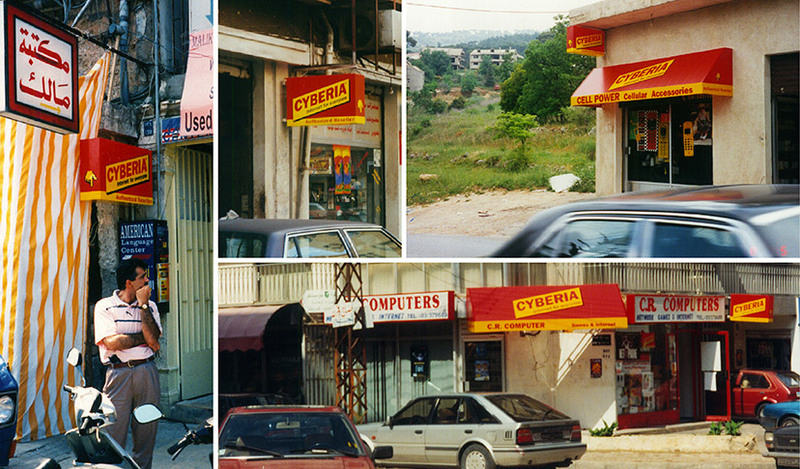 Coffee and cigarettes were pretty much the only products with small shop lightboxes at the time, and after Cyberia, every other internet provider brand followed. 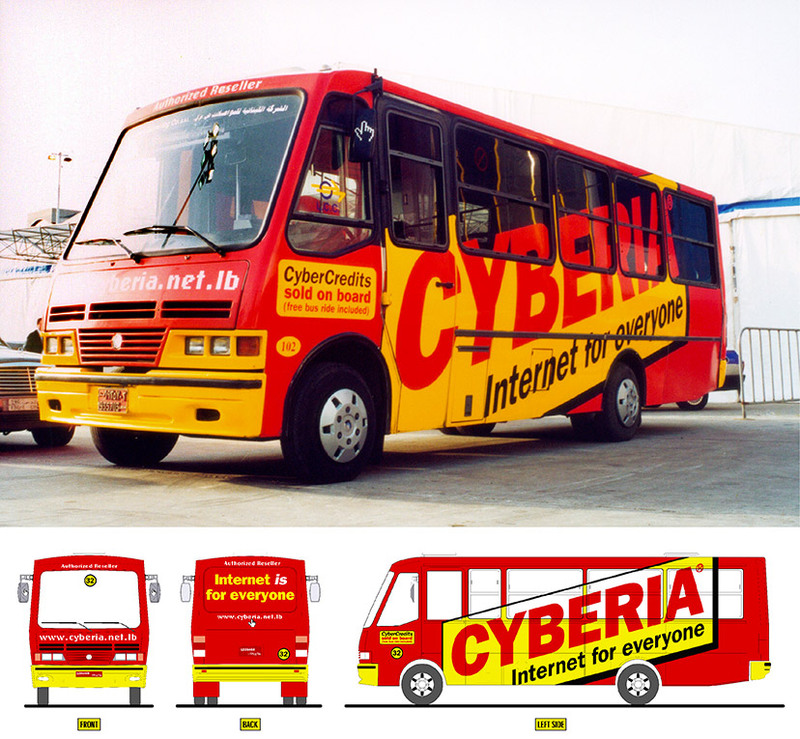 Lebanon’s first fully branded bus, was also a sales point, with internet credits sold on board. Many have paid tribute to Milton Glaser’s 1977 “I heart NY”, and this one is ours. A price war between competitor brands pushed internet prices down from $45.99 to $13.99 within a year. Cyberia could only play the game for so long, and eventually opted for a lighthearted surrender. 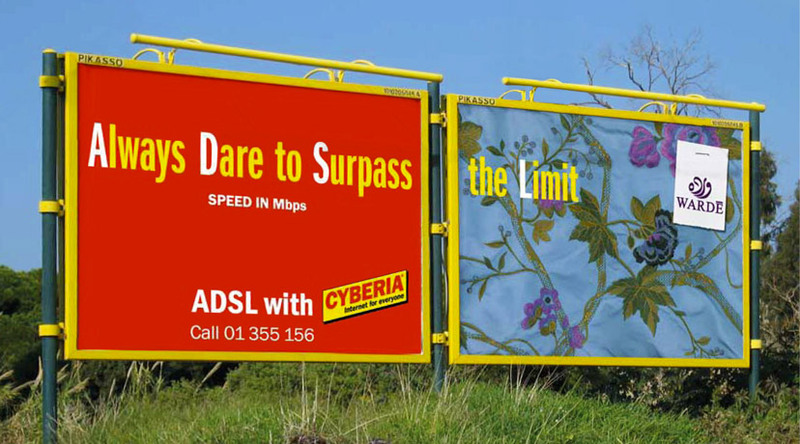 This award-winning outdoor advertisement for the ADSL service benefits from a neighboring billboard (for a client of ours at the time) to really push the message through..
For an ad campaign on better internet speeds and prices, a vernacular tone is adopted to strike wider appeal. Many sponsorship activities can be forgettable, irrelevant, or even all out inappropriate. Think of a junk food brand sponsoring a major athletic event. It’s not unheard of, and it probably achieves the financial goals for both sponsor and sponsored, but the irony never really escapes the audience. 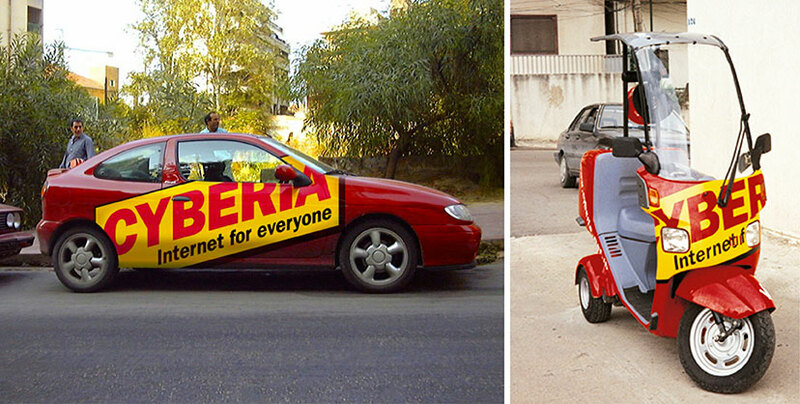 For Cyberia, we wanted an endorsement scenario with popular appeal that links clearly to the service, and what’s better than “internet” and “speed”. 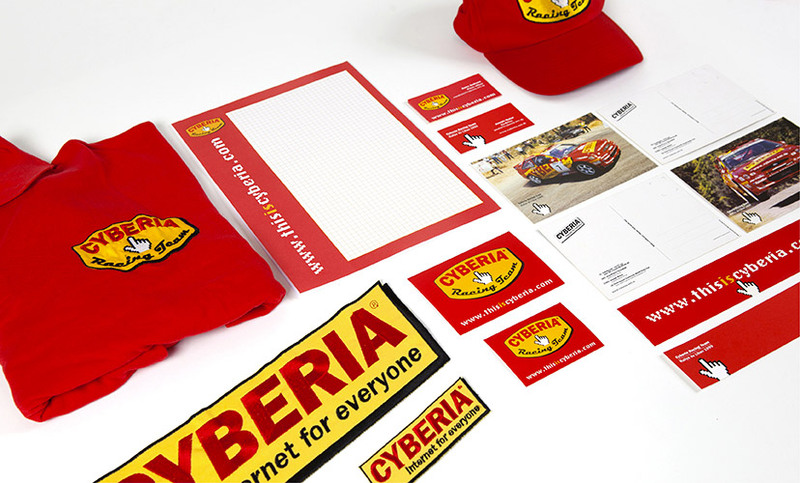 For two consecutive years, Cyberia Racing Team was assembled behind Lebanese rally champion Jean-Pierre Nasrallah, adorning everything from uniforms to a truck to, of course, the race car itself. It was fun. It was ferocious. It was fast. Perhaps too fast for the dial-up speed of the time. But hey, it was the late 90s after all. The Cyberia Racing Team logo is all about pushing the speed button. The mark had to be embroidered on team uniforms and other wearable items. A number of Racing Team memorabilia was developed for the rally events. The heavy duty Cyberia Racing Team transport vehicle. 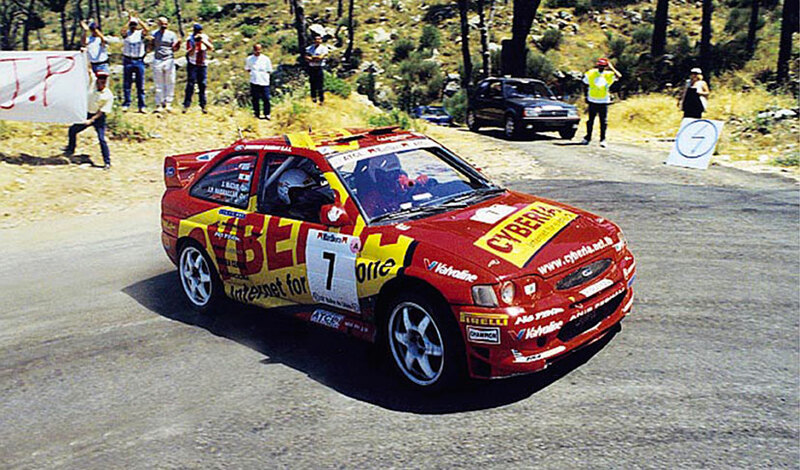 The rally car was probably the most fun to brand (and watch).